My price includes postage and packing within the UK, items usually being despatched within 48 hours of receipt of funds. I am happy to send items abroad but buyers from overseas should contact me for shipping costs and make an additional payment. Buyers are liable for import taxes in their own country where appropriate. Remember - on most pages you can click pictures to see more photos! These are photos of the actual model available. Remember that these toys are around 50 years old! All models advertised are original, not restored or repainted unless I have stated otherwise. The current range of Bentleys available for this set display is shown below. They can also be purchased individually when they will be supplied with the promotional material relating to the TV series shown. 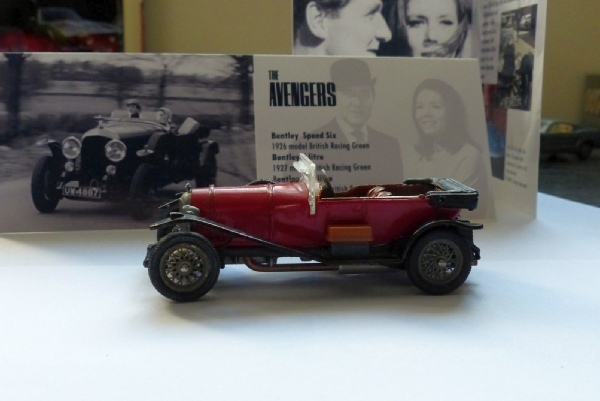 The cards include details of the Bentley and Lotus used and model varieties. Illustrated here is B6, a nice red one I had available but now sold. This has silver wheels. The red paintwork is very good at the sides with just a few marks near the screen on the bonnet. The black rails are nice and shiny and seem to have survived better than most with few imperfections that I can see. The handbrake and horn are in place. I think the screen has been replaced but it is not easy to spot as it has been done well. Steed may appear in some photos but is not included unless you purchase the full GS40 box set. There are more at the links below.